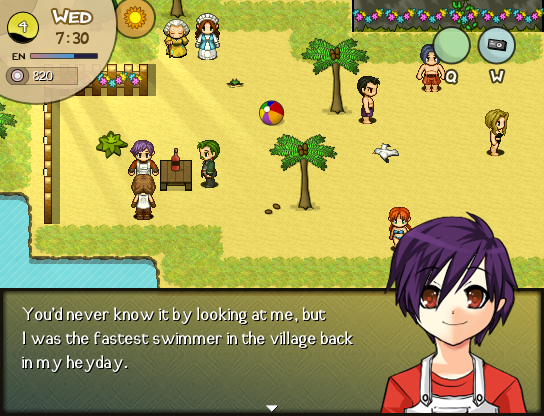 Inspired by slow-paced games like those in the Harvest Moon series, World's Dawn allows players to experience life in a sleepy farming village off the beaten path. If the town of Sugar Blossom is to ever rediscover the spirited essence it once held, its newest resident must make it so... That's you! After moving into an old farmhouse, you're free to explore and participate in a number of activities from day to day. These include growing crops, raising livestock, building relationships with townsfolk, fishing in rivers and ponds, shopping, cooking, foraging, trading goods, playing sports, attending markets and festivals, flirting and marrying, and many more. Even after playing through an entire game year (which will offer 30+ hours of content) you'll find there is still plenty to surprise and entertain you in the friendly farming village. Currently, the complete SPRING and SUMMER seasons are available for download, with autumn and winter under development and planned for release within the next few months. Thanks so much for your interest! Don't forget to leave a comment! Great Zombie Jesus, I love Harvest Moon/Animal Crossing type games, and this ones looks really promising. Hope you can keep up the pace! @cozziekuns : Thanks so much! This project's been a lot of work already, but I'm confident I can keep up the pace and get a demo out in the semi-near future I hope the game doesn't disappoint! If anyone is interested, I've updated the original post with some new content. There are updated screenshots (with a new style of path) as well as a couple demo videos. Let me know what you think! This looks fantastic! I can't wait to play it. The only thing I find a bit off are the text pictures. They look a little....unsettling. Maybe that's just me though. Wow! This looks amazing; you're clearly a very talented game designer and I wish you the best of luck in this project. Like cozzie, I too love games like this. I'll be looking forward to seeing this project finished. Keep up the good work! The only thing I will mention here is: I like the trees a lot, but the character sprites seem a little big compared next to them. That's not a big deal though. True, and gosh, love the sprites! They make the game so cowl.Nicely done so far! I am so excited for this project's release! I have made about 2 games with the same principal and concept of your game (mainly because I wanted to create an RPG Game that was fun and interactive without all of the typical advanced battling systems, cliche plots, unfulfilling endings, etc.) 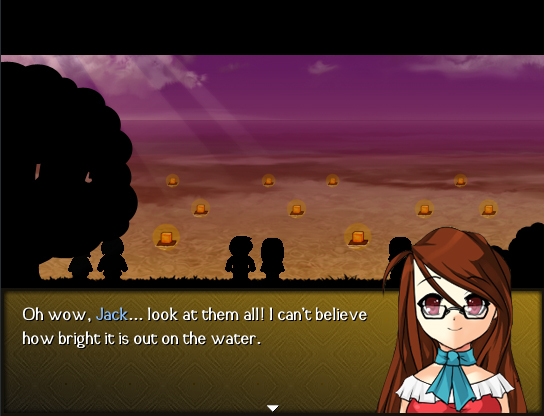 Of course, I am no where near as masterful on RPG Maker VX as you are because I mainly use RPG Maker XP. Your original graphics are inspiring and your town has a cozy atmosphere to it that I didn't know VX games could have, because they are usually so boxy and unrealistic. Keep up the good work! While I won't refute the fact that your tiles are very nice, I'm not exactly fond of the style. Too simplistic for my tastes, imo. The autotiles in the outdoor maps also kind of betray the grid. Not a big deal, I know, but again, it's not a style I'm used to. Everything else is top-notch, though. I can't guarantee that I'll play it since I myself am not a fan of games similar to Harvest Moon, but it looks great from a purely stylistic point of view. I absolutely love the artistic style of this game. Put together with a life-sim makes me want to drool. Will look forward to playing this. Yay! Would love to play it. I'm also huge fan of Harvest Moon series! I really like the logo symbol, representing day and night together. I've never played Harvest Moon (I will soon, because a friend recommended it to me), but I've played Animal Crossing before. I love these types of games. This seems like a good game. Looking forward to playing the game! I truly appreciate your feedback, it's the best motivator there is. I'm happy (and a small bit nervous) that so many people are looking forward to the game and offering their full support. Thanks so much! @Acolyte : Thank you a ton, I'm glad you're excited to play What exactly looks unsettling about the text pictures? Or is it too hard to pinpoint? Criticism is very much welcome! @modern algebra : I really appreciate your feedback especially, as 1) you're such a respected member of this community and 2) I use your fantastic scripts all the time Enough brown-nosing, though... Thanks so much for your comments and support, I'll definitely keep up the work on this project and see that it's released in the reasonably near future. You're not the first person to mention those trees, by the way... I'll see what I can do! @DarkGamer : Thank you very much for the compliment. I hope you enjoy the game when it's released! @beyondtheanonymous : It's great to hear you've made similar games because I think a lot of people like this kind of project (without the battles, leveling up, etc.) and would like to design them, but they're really an exhausting amount of work! Hah so I'm glad you can appreciate everything that's gone into the project so far... and I'm especially happy the cozy atmosphere that you mentioned comes across even with just the screenshots. Thanks a ton! @deadnub : Glad to hear you're looking forward to it. Thanks for your comments, I really hope he project lives up to all these expectations! @Fizzly : Alright, another fan of Harvest Moon! I can all but guarantee you'll like this project too, as it's very much inspired by that series. I appreciate your comment on the logo, too... It's an important feature that (sadly) a lot of people don't put enough thought into. @Kyogia : Play Harvest Moon! There, there's two recommendations I hope you like this game as well! This game has been nominated for Project of the Season: Autumn 2010! Congratulations and good luck! Is the house decorating evented? Wow, congrats on the nomination! Also, I've begun to play Harvest Moon DS. It's interesting but so far I've just planted seeds and collected plants to sell. Anyway, hope this game becomes the game of Autumn 2010. I'll vote for you and your game! Congratulations! This project has won Project of the Season for Autumn 2010! This means that your project will be sticked and featured on RMRK's homepage for the duration of the season. Naturally, you may also mention the award when publicizing the project. Great work and again, congratulations; you deserved it! Thank you so much! It's such a great honor to win the first Project of the Season award, I almost can't believe it considering all the great projects around here. As far as progress goes, my semester just picked up recently and it's been tough finding as much time as I would want to work on World's Dawn. However, I promise that a playable demo is not far off at this point and I certainly hope it will be worth the wait. Congratulations on winning Project of the Season! It was a deserving award for your persistent efforts in making this timeless, unique and highly original game. I am so excited for the demo of this game that I have bookmarked this page. Sometimes people receive publicity when they are not deserving of it at all - that is not the case for you. I am so exhilarated someone who is so talented and determined is being recognized for their hard work. @beyondtheanonymous : I truly appreciate your kind words Almost too kind! I'm glad you're looking forward to the demo with such fervor and I very much hope it doesn't disappoint. I'm stoked about this game, it's got a lot going for it and you seem to have committed quite a bit. The customizing is freaking amazing and it looks lke there's tons to do. Your maps are looking like they're missing something though, maybe just a little more detail. Sugar Blossam looks awesome, but once again are you incorporating any wildlife of some more NPCs maybe, it just seems very straight forward and could use some meshing of life. I'm curious what the town life is going to be like. Thanks again for your comments, I really appreciate it. 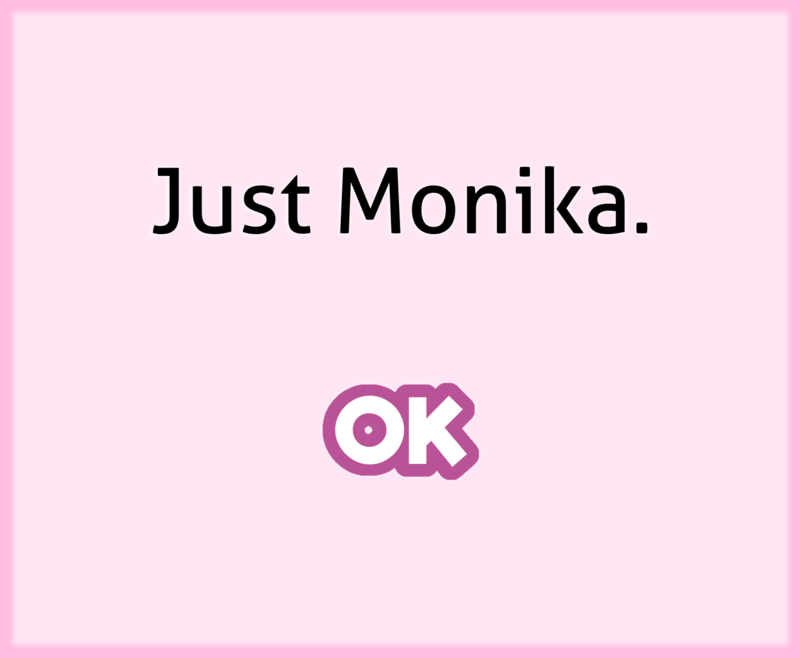 And I hope to hear more after you get a chance to play the demo! It's been a long time coming, but the World's Dawn demo has finally arrived! This is the main project I've been working on for close to a year, so I'm proud to say players can finally experience the game for themselves through this special teaser. The "Guided Demo" includes original graphics and gameplay systems that will appear in the final product (scheduled for a 2011 release). I will personally guide you through the demo as Sagitar to ensure you get the most out of the contained features... I'll even let you know if you missed anything important upon completion! A single playthrough should take about one hour. I purposely avoided including any unfinished features or systems in the demo. Houses with incomplete maps will be locked from the outside; characters missing facesets or dialogue are left out completely... So while it's clear this is not a finished product, the demo should show a fair amount of polish. I didn't want players to encounter any strange glitches or vacant locales in Sugar Blossom Village. Click the image below to download the demo! (If you need to find this link in the future, it's located on World's Dawn site as well as a number of project threads around the RM community). Once you play, do me a favor and leave your comments. Feedback is always welcome, and player input is vital in helping the game grow. A hearty thanks goes out to everyone who has offered their resources, wisdom, and support throughout this year-long process. Arrow likes this idea. Arrow likes the art and the general concept. Arrow will not be downloading this now, at 3:00 in the morning, as it is his mellow time and the download might take precedence over the music he is streaming on his crappy connection, but Arrow will certainly be bookmarking this onto his toolbar and downloading soon.